This is a rushed blog post because I don’t want it to run tomorrow. You know. April Fool’s. Or is it Fools’? Whatever. I don’t want to publish something tomorrow because publishing and getting a book published is no joke. There are many avenues to self-publishing available and viable to those who choose that route. I am actually a co-author of a devotional that was self-published, and you are more than welcome to let me know if you are interested in buying a copy God’s Graffiti Devotional from me. But the other book I co-authored with four other amazing women just entered its 8th printing. 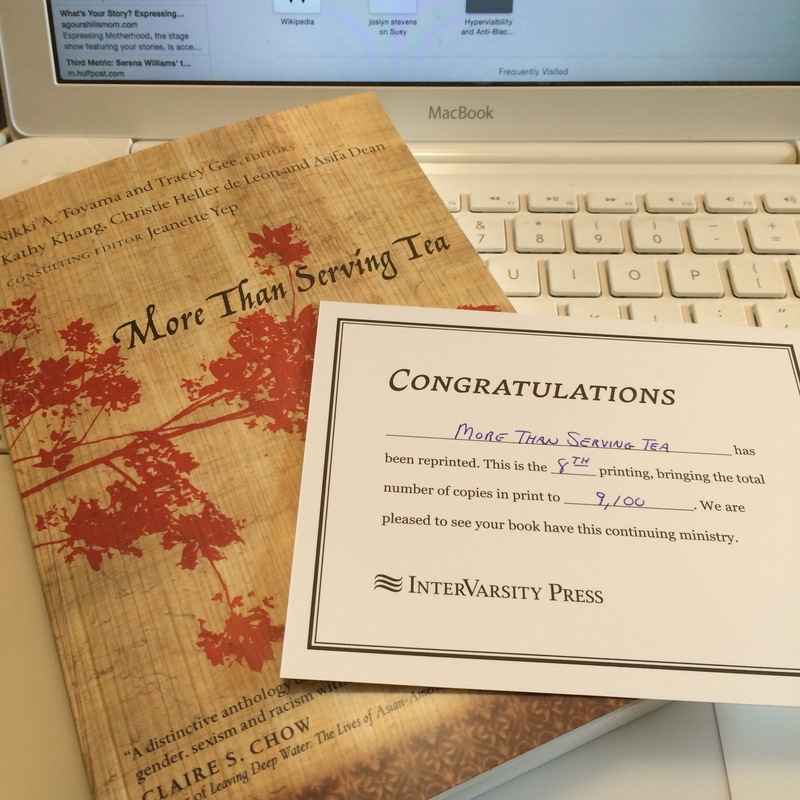 More Than Serving Tea is not going to be a NY Times best seller, though IMHO has more wisdom in it that some of the self-help stuff that makes that list, but as I posted a photo celebrating the fact that the book is still in print I was engaged in a short FB conversation with a friend about the lack of writers of color in the recent InterVarsity Press catalogue – the same publishing house that took a risk on and supported More Than Serving Tea. 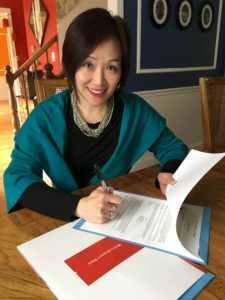 The road to getting a book published is longer for some than others, and it is connected to privilege as much as it is connected to actual writing talent. It drives me berserkoid when Christian authors say things like, “God opened the door” because it’s weird how many more doors are opened for white authors. Just sayin’. I’m pretty sure God isn’t sitting in heaven waiting for more authors of color to pray, “Lord, open those publishing doors for me.” I am not saying that all white authors have those connections. #notallwhiteauthors I am saying that Christian publishers are still set up within the cultural norms that were established for and by white authors and readers and for their success and reading pleasure. This post isn’t about all that needs to happen to dismantle that mess. I can’t do that in one post just like we can’t dismantle white supremacy in one post. This post is about full disclosure, authenticity, honesty, vulnerability so that you, my truly dear readers and folks joining me on this ride, get the whole story, which is more than a lovely IG post celebrating the 8th printing of a book that came out 10 years ago. In the publishing world that isn’t even a drop in the bucket. But I contributed to that drop and it took a lot of blood, sweat, and tears. So I’m writing this post to share with you a secret I have been keeping because this will help people who are dreaming to keep dreaming, others to start dreaming, and maybe others to support us dreamers. I have a book proposal. It’s public now. Usually authors don’t share that part. We share the reprint notices. We post photos of our contracts. We invite you to be a part of the launch team. I’m here to invite you into one of the scariest parts: rejection. I just sent the FOURTH version of my proposal to my editor today, the same day I got the 8th printing notice. I won’t lie. I’m hoping that was a good omen. But I won’t lie. I didn’t think I’d be on my fourth version of a proposal when I started the first version in OCTOBER. At this rate, my daughter will graduate from college before I publish another book. Before the launch is a million waves of doubt. Do I have enough for an entire book? Will I get a contract? Will anyone read the book? Will anyone actually LIKE the book? One of the reasons this female author of color hasn’t been published again is because I am afraid. Rejection is part of the process, and I don’t know anyone who enjoys repeated rejection. 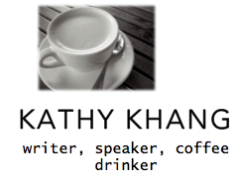 Writing and all other art requires a degree of confidence, ambition, humility, and a sense of humor. It requires more things, but those were the first things that come up for me. As a soon-to-be graduating college student applying for reporting jobs, I kept my rejection letters on the apartment refrigerator numbered and complete with corrections in red ink. That was my sense of humor. But I kept applying and that is where confidence, ambition, and humility come together. You keep trying even though it doesn’t look like it’s going to happen. You keep writing because you did get some good feedback. You write because that is what you know to do. So I’m sharing the secret of my yet-to-be-accepted book proposal to invite more of you into this journey, so that more of us can silence the fear of rejection a little bit, just enough to sit down and write and put together a proposal that has to be revised. I’m letting you know that I’m trying because I think it’s in my DNA, the way God created me, and I’m not going to wait as if the immaculate conception could take book contract form. It’s not glamorous. It’s rather tedious. It’s not waiting for inspiration to hit. It’s sitting at a blank screen day after day after day. I’m letting you know because some of you need to know you are not alone. Tomorrow is another day in front of a blank screen, and we will love most minutes of it.